BETTER THAN READY (AUS) (Bay or Brown 2009-Stud 2015). 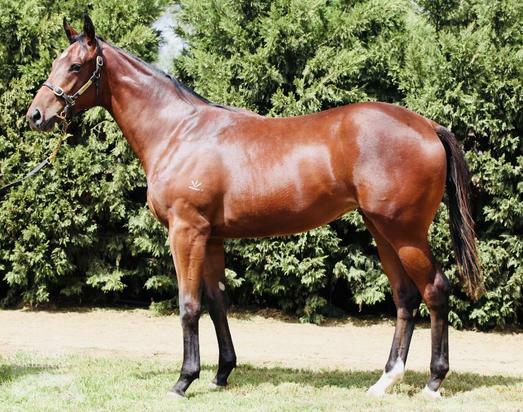 8 wins-1 at 2-to 1200m, $484,875, ATC Brian Crowley S., L. Out of a half-sister to SW Publishing. Sire of 34 rnrs, 15 wnrs, inc. SW Better Reflection (BRC Calaway Gal S., L), The Odyssey and of Betaima, Girls are Ready, Well Prepared, Arnwood, Hezhome, Bettahoney, Bluey's Ready, Jagged Edge, Lepreezy, Redeski, Secondofmay, The Sinner, Tiger Love and of the placegetters Nobody Better, etc. His oldest progeny are 2YOs. RIDOLFI, by Fastnet Rock. Raced twice. This is her first live foal. Bond Elegance. 3 wins at 1200m, HK$2,926,110, to 2017-18, HKJC Kam Tin River H., Gloucester H., Kowloon Park H., 2d HKJC Jasper H., Kyoto H., Carnarvon H., 3d HKJC Middle H., Kalanchoe H., Repulse Bay H., Tin Ha Shan H.
Minetti. Winner at 1000m, 2d VRC Phar Lap Club 2YO P., MVRC Jeep 55 Second Challenge Heat 9 H., 3d MVRC Bertocchi Famous Xmas Ham H.
Mameli. Winner at 1000m in 2018-19 in Aust. Italian Alps. Winner at 2 in Aust. LA ITALIA (Stravinsky). 3 wins. See above. Kaimana. 2 wins at 6f, Hollywood Park Allowance. Producer. OMEI SWORD (High Chaparral). 2 wins-1 at 2-at 1100m, 1200m, A$482,025, ATC Silver Shadow S., Gr.2, Peter Svendsen 2YO H., 2d ATC Golden Rose S., Gr.1, Surround S., Gr.2, Magic Night S., Gr.2, 3d ATC Golden Pendant, Gr.2. SHADOWBDANCING (Montbrook). 15 wins-1 at 2-from 6f to 1¼m, US$1,003,530, Prairie Meadows Cornhusker H., Gr.2, Remington Park Governor's Cup, L, Mountaineer Park West Virginia Governor's S., L, Mountaineer Mile S., L, Prairie Meadows H., L, Prairie Meadows Derby, L, Fonner Park Bosselman-Gus Fonner S., L, Prairie Meadows Prairie Mile S., L, Jim Rasmussen Memorial S., L-twice, Hawthorne Bonasera S., L, Cryptoclearance S., L, 2d Prairie Meadows Cornhusker H., Gr.2, Mountaineer Mile H., L, Hawthorne Cryptoclearance S., L, Hula Chief S., L, Prairie Meadows Jim Rasmussen Memorial S., L, 3d Hoosier Park Michael G Schaefer Mile S., L, Prairie Meadows H., L, Fonner Park Bosselman-Gus Fonner S., L, Prairie Meadows Golden Circle S., L, Jim Rasmussen Memorial S., L, 4th Prairie Meadows Cornhusker H., Gr.3, Penn National Swatara S., L, Remington Park Governor's Cup, L, Fonner Park Bosselman-Gus Fonner S., L. Sire. ASIA EXPRESS (Henny Hughes). Champion 2YO Colt in Japan in 2013. 4 wins-3 at 2-from 1400m to 1800m, 176,336,000¥, Nakayama Asahi Hai Futurity S., Gr.1, Niigata Leopard S., Gr.3, Tokyo Oxalis Sho, 2d Nakayama Fuji TV Sho Spring S., Gr.2, Hanshin Antares S., Gr.3, Nagoya Daishoten, L, 4th Niigata BSN Sho, L.
TAKE IT LIKE A MAN (Run Away and Hide). 8 wins-1 at 2-from 5½f to 1m, US$428,158, Charles Town Researcher S., L, 2d Fair Grounds Thanksgiving H., L, 4th Fair Grounds Duncan F Kenner S., L.